After a PhD at Institu Néel on the depth magnetic profile of ultra-thin films I get interested in the ultrafast magnetism dynamics by performing a post-doctorate at Stanford-SLAC and then at Laboratoire Chimie Physique - Matiere et Rayonnement (Paris, UPMC), in which I am now Chargee de Recherche (Staff Scientist). To probe magnetism with a spatial (nm) and time (fs) resolution I am using synchrotron or free electron laser (FEL) sources in a pump-probe geometry. Most experiments focused so far on characterizing magnetization and charge carrier dynamics, while the first direct measurements of structural dynamics during ultrafast demagnetization were reported only very recently. I have investigate the infrared laser-pulse-induced ultrafast demagnetization process in a thin Ni film. To bring new information we have employed resonant magnetic x-ray reflectivity to follow simultaneously magnetization and structural dynamics at the BESSY femtoslicing source. 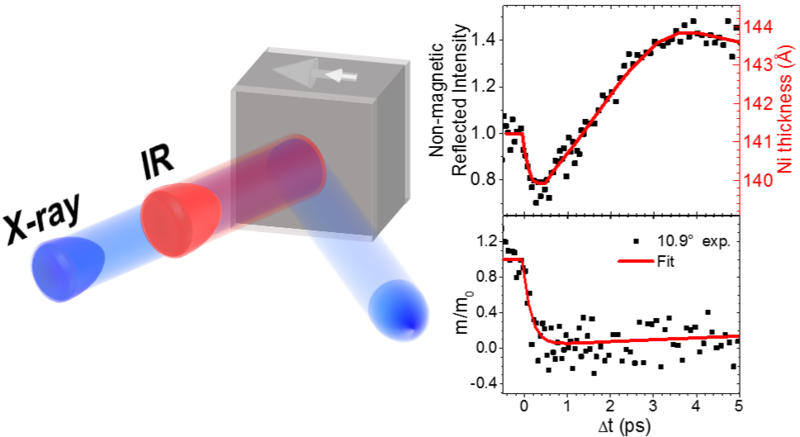 We found that significant changes in nonmagnetic x-ray reflectivity accompany the subpicosecond demagnetization, which can be modeled as a variation of film thickness. We are further investigating what is at the origin of an ultrafast contraction and if this phenomenon depend on the magnetic layer and/or cap layer. Figure 1: TR-XRMR principle and non-magnetic reflected intensity and normalized magnetization in function of time delay for a reflected angle of 10.9°. In red, Ni thickness in function of time delay for the upper pannel, and exponential fitting for the lower pannel. Our simulations further show that the higher photon flux and energy resolution provided by x-ray free electron lasers will yield decisive data to differentiate between different mechanisms proposed to govern ultrafast demagnetization dynamics. Indeed, the XRMR technique allows to derive a depth magnetic profile (see past research). Being able to perform time-resolved measurement at different angle and energy will allow us to retrieve the time and depth resolved magnetic profile during the ultrafast dynamics. Those information will allow to confirm or infirm different theoretical model. In normal pump-probe experiment one need to repeat the measurement for each time delay to get a complete demagnetization curve. We have developped a new experimental approach based on the use of zone plate to streak the photons. The concept is shown in figure 2. In one single shot of XUV, the pathway of the photons coming from the right and the left side of zone plate is not the same, inducing a time delay with the infrared pulse. We look then to the XUV magnetic circular dichroism signal thanks to a 2D detector (CCD). Figure 2: X-ray streaking princple. The zone plate focus the XUV pulse onto the sample where an infrared pulse is coming at the same time. The path difference for the photons coming from the right and the left of the zone plane can be directly converted to the time delay between the XUV and IR. The magnetization signal is simply the circular dichroism of the sample since the XUV pulse is circularly polarized and the sample magnetization is out of plane. For normalization purpose, we are using the -1 order of the zone plate and a second detector. This developement and experiment have been done at FERMI on the DiProI beamline in close colaboration with the beamline scientist Flavio Capotondi and the PSI which have providen the zone plate (Christian David).